A few weeks ago, my husband and I took a weekend trip to San Francisco. There are a number of fantastic restaurants in the city, and I had been wanting to try a Greek place called Kokkari for some time. We made a point of stopping there and trying as many different dishes as we could. We decided to order appetizers rather than filling up on a main course. Choosing small bites meant we could try a variety of flavors, including a tempting Citrus Salad. I had ordered the dish thinking the citrus would be tossed with greens, but it ended up being more like a light dessert. Our astute waiter served it last because it was definitely more sweet than salad. It proved to be the perfect end to our meal– chilled orange slices in a light, orange-scented simple syrup topped with crushed nuts and chopped dates. I made a mental note to recreate the dish at home. Here, I’ve taken the basic concept from Kokkari and put my own spin on things. I infused the simple syrup with rosemary (if you’re not a fan, use fresh basil or mint instead). It may seem like a lot of sugar at first glance, but most of the sugar syrup is left behind when you serve. 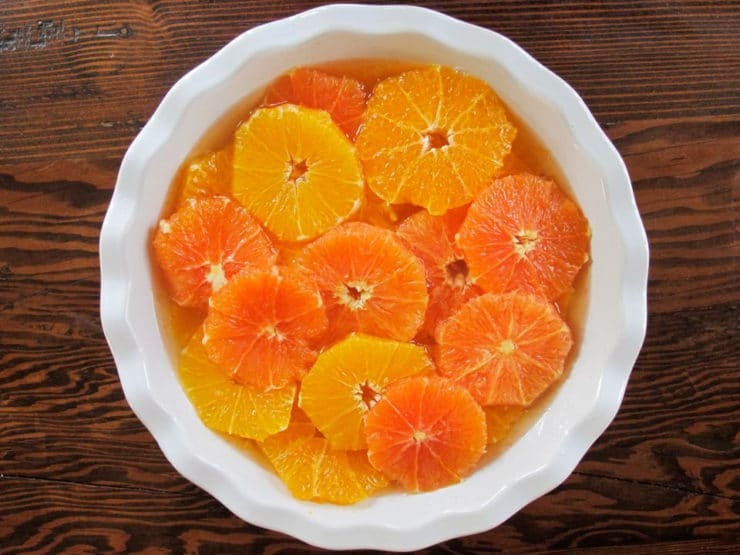 I used a variety of oranges– navel, moro, cara cara– to add a variety of colors and flavors. 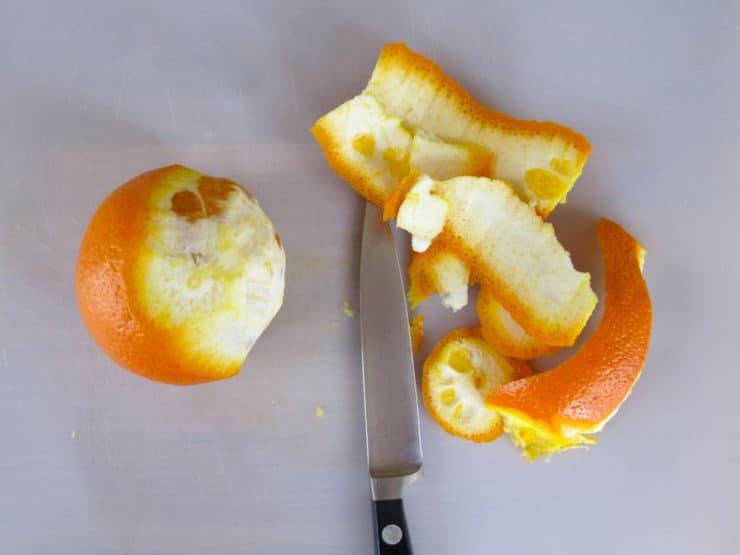 Seedless oranges or those with very few seeds work best for slicing. 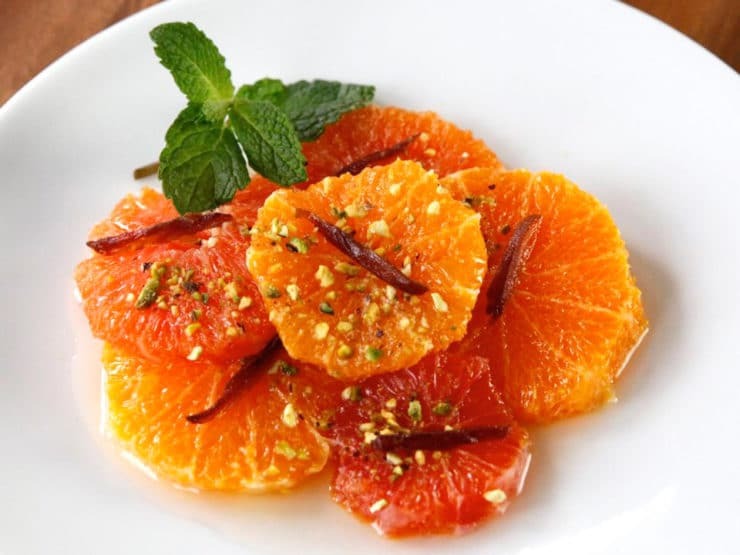 After letting the orange slices chill and marinate in the sweet rosemary syrup, I served them topped with pistachio meal and thinly sliced dates for a yummy, exotic finish. You can make the oranges and syrup up to two days ahead, letting the oranges chill in their marinade till you’re ready to garnish and serve. This simple and sophisticated dessert is a lovely, refreshing way to end a meal. Enjoy! 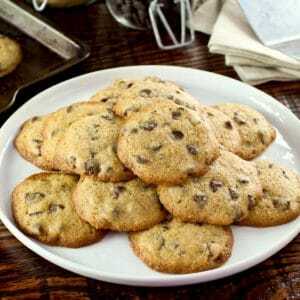 Combine 1 1/4 cups sugar and 1 cup of water. Bring to a boil, whisking to dissolve the sugar. Add the fresh rosemary sprigs and reduce heat to a simmer. Let the syrup simmer for 10 minutes, then remove from heat. Leave the rosemary sprigs to steep as the syrup cools. Use a sharp paring knife or serrated knife to slice off the peel down the sides of the orange. Remove as much peel and white pith as possible. Try not to slice into the fruit itself (a little of the fruit will inevitably get sliced... just be as careful as you can). 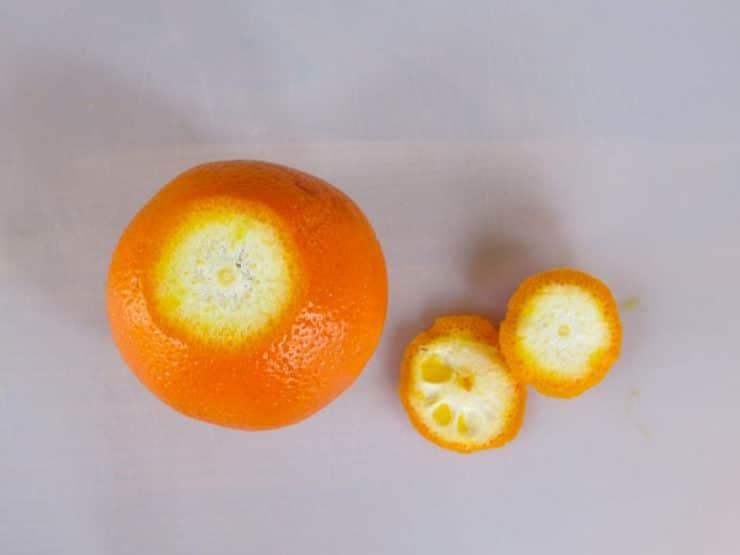 Once the peel is removed, slice the orange into thin ¼ inch rounds. 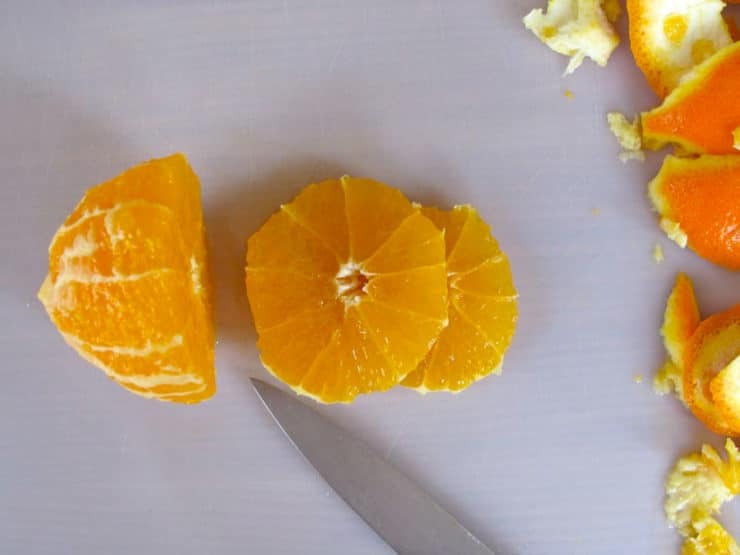 Reserve slices and repeat process for remaining oranges. When rosemary syrup has completely cooled, remove the rosemary with a slotted spoon and strain the syrup through a wire mesh strainer. Spread the peeled slices out in a pie dish or similar ceramic or glass container. 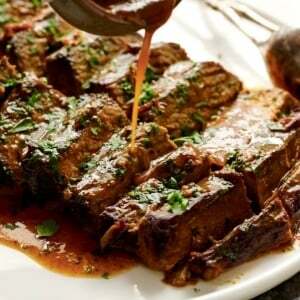 Pour the rosemary syrup over them. 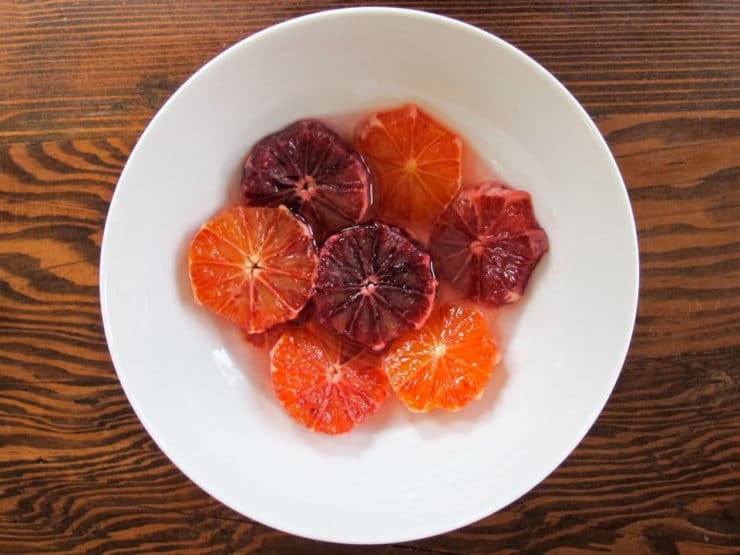 If you're using blood oranges/moro oranges, store those slices separately from the lighter colored slices in their own quantity of rosemary syrup, otherwise they will cause the lighter oranges and syrup to take on a reddish color. Cover the dish and refrigerate the orange slices for at least 2 hours, up to 2 days. Re-layer the orange slices every so often to make sure they're all equally exposed to the sweet syrup. 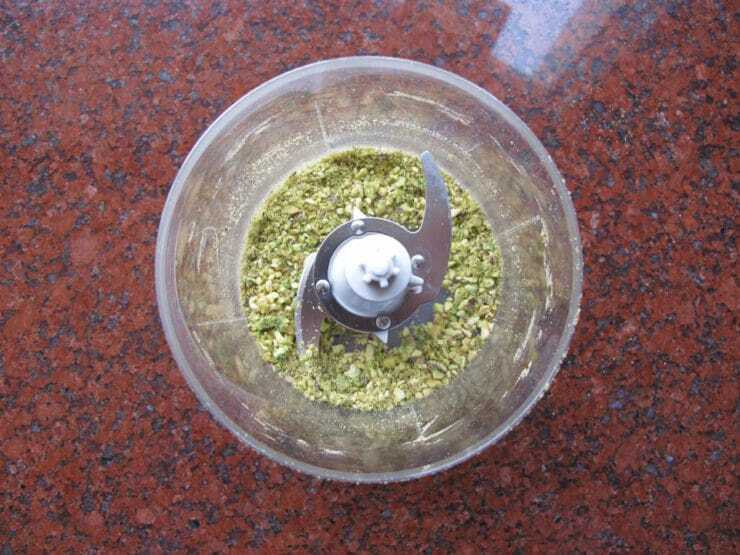 Before serving, chop the pistachios in a food processor or coffee grinder into very fine pieces, somewhere in between chunks and powder, to create a coarse pistachio meal. 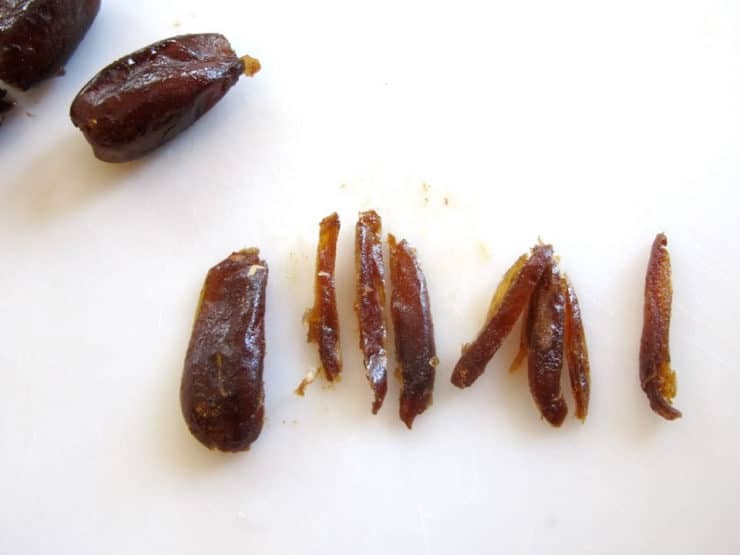 Slice each date into thin strips. To serve, divide the chilled marinated orange slices between 8 small dessert plates. Drizzle each serving with 1-2 tbsp rosemary syrup, just enough to moisten (you will have leftover syrup, which you can use to flavor drinks). Sprinkle with 1 tsp chopped pistachios and top each orange slice with a date strip. Garnish with a sprig of mint. Serve. Note: If you have nut allergies, you can leave out the pistachios. The oranges taste delightful in their syrup without any additions, so if you want to keep things simple feel free to serve the oranges on their own in a glass dessert bowl garnished with mint. This is great ! Refreshing idea for all the occasions ! Thank you for sharing this beauty ! How long can you make this before serving? Will it keep in the fridge. It looks perfect for using up stack of tangerines I have and be refreshing dessert after a curry. Thank you! Then the next instruction is “When rosemary syrup has completely cooled, remove the rosemary with a slotted spoon and strain the syrup through a wire mesh strainer.” However, up to this point, there is no previous instruction about making the syrup. Have I missed something? Hi Helen! I’m sorry, when I categorized this as a “featured recipe” this week my recipe input system glitched and the first line of the recipe disappeared. It happens from time to time, my web techs still haven’t figured out why. 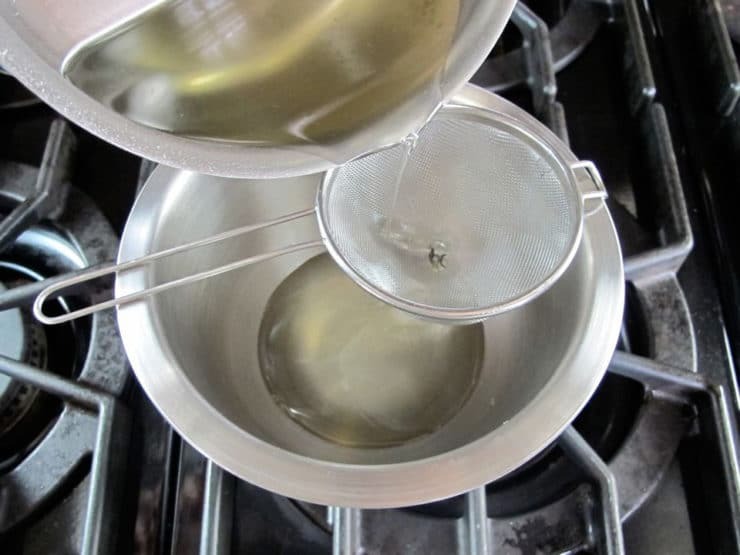 I just replaced the first line of the recipe, which includes instructions for making the syrup. so it should read clearer now. Thank you for letting me know! I love anything citrus and rosemary, wow. I can’t wait to try this! I have been doing my version of oranges sliced in this fashion for a long time. I learned from my Mom. I just drizzle the slices with honey and some cinnamon (also very Greek) to taste. The juices of the orange mingle with the honey making its own syrup. Sometimes I add some toasted almond slices. I think the pistachios are a divinely inspired idea and am going to try that. I like this at breakfast or brunch too. I found blood oranges, naval oranges, and tangerines in my supermarket, so I tried this recipe today. It turned out wonderfully. I’m thinking about making it as a Passover dessert in a few weeks, and I’m looking forward to using the leftover syrup in tea! Fantastic Molly! The syrup is so lovely, isn’t it? I think it would be great in a mocktail or cocktail, too. No syrup involved. It’s olive oil, sea salt, cinnamon, and a sparing drizzle of rose water. Hmmm. I wonder who your astute waiter was. Do you happen to remember his name? I’ll pass along your compliments. During the winter, I eat this salad at the end of every shift and I sometimes make it at home, too. 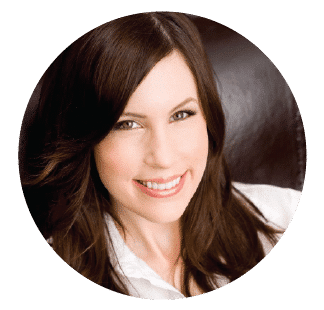 I really like your idea of adding pistachio to it– saves me from having to make candied walnuts! I didn’t catch his name, but he was really fantastic. 🙂 I do love how easy this salad is, with such delicious results. I think the Kokkari version had orange blossom water in the syrup, if I remember correctly, which is also divine and an easy sub for the rosemary.